Moulding die is a manufacturing process, which is used directly or indirectly in almost every industry. It is a primary manufacturing process and has its effect on the properties of the resultant product. In this era there is a demand to innovate processes, which can reduce lead-time, reduce cost of production without compromising with the quality of the products and reduce ill effects on environment. Electro Magnetic mould die is an innovative process having a great potential to replace conventional moulding die methods due to various advantages associated with it. This setup includes winding of copper wire such that it behaves like a solenoid with hollow cavity in which actual moulding die process is to be carried out. The setup was prepared with copper wire and winding is done until required magnetic field is created. The prepared setup and trial runs shows that there is a scope of creation of similar setup at large scale so that can be used at industrial level to utilize its advantages of reduced cost, reduced lead-time, reduced effect on environment and imparting improved properties to the resultant product. Moulding die is a manufacturing process that can be performed in a number of ways. The type of process employed for moulding die has an effect over properties like surface finish, microstructure, hardness, toughness, etc. of the resultant product. In modern days industries there are many factors, which affects the decision of selecting the type of moulding die process to be used. This includes properties of cast product, cost incurred in manufacturing, lead-time, and environmental effects of the process. Magnetic mould die is an application of electromagnetism to the process of moulding die. Steel shots constitute the mould that is formed by application of magnetic field on them. The application of magnetic field that induces magnetic bonds between steel shots which gives strength to mould. This reduces the time elapsed in ramming process. Also, breaking of mould becomes easier by using magnetic field, as it is required to switch off the supply to turn down the magnetic field and mould breaks. This process employs a one-piece mould and an EPS (expandable polystyrene) pattern, which gives an advantage of cast products being free of defects associated with joint line. Also the products have better dimensional tolerances than the products obtained from conventional methods. The amount of machining required is less thus reducing the time and cost involved in finishing a product for use. The mechanical properties like tensile strength, impact strength and hardness of the products cast from this have higher values as compared to sand moulding die products. The reason behind this improved might be the higher solidification rate of steel mould as its thermal conductivity is more than the sand mould. A hollow cylindrical box of aluminums is used to wind the coils over it. Copper wire is used. copper coil is used for coiling. An iron box is inserted into the mould box to form the core for magnetic field. For supply to the copper coil, a power rectifier in series to battery is connected. DC supply is given to the copper coils. Steel shots are filled in the mould box and then pattern is kept in center and steel shots are kept pouring. Steel shots are poured up to the level of pouring basin. After the settling of pattern in surrounding steel shots supply is switched on and magnetic field is applied on steel shots. These steel shots gets bind to each other due to magnetic force and thus a mould comprising of steel shots around the pattern is formed. Increasing field intensity, which can be increased by increasing the voltage, increase strength of mould. Voltage can be increased by using autotransformer up to a certain limit only because higher value of voltage may lead to burning of coils. 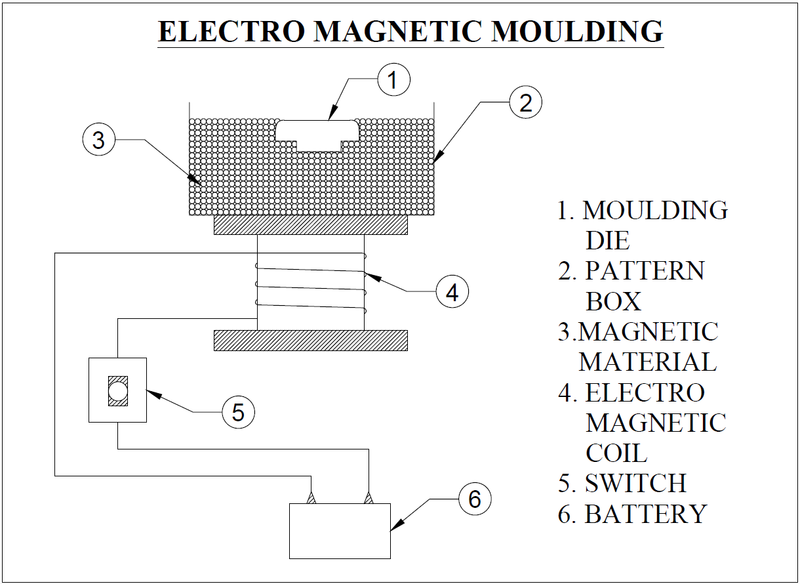 Magnetic moulding, is an innovative process and it is an expendable model and it is used that is surrounded by metallic particles bonded together by the action of an induced magnetic field. In that magnetic moulding process have the advantages of the lost foam process and the permanent mould processes. The benefits of magnetic moulding one precision magnetic moulding can replace a sub-assembly. The magnetic moulding process produced the high-quality and the complex parts at a very competitive cost.